October 5 – The reason why some International Space Station astronauts have returned to Earth with changes in their vision has been a mystery, but new noninvasive techniques to examine crew health in orbit may provide researchers with much needed insight into the problem. A number of astronauts who have returned to Earth after long stays aboard the space station have reported a subjective change in their eyesight. A dozen or more had documented anatomical eye changes post mission. 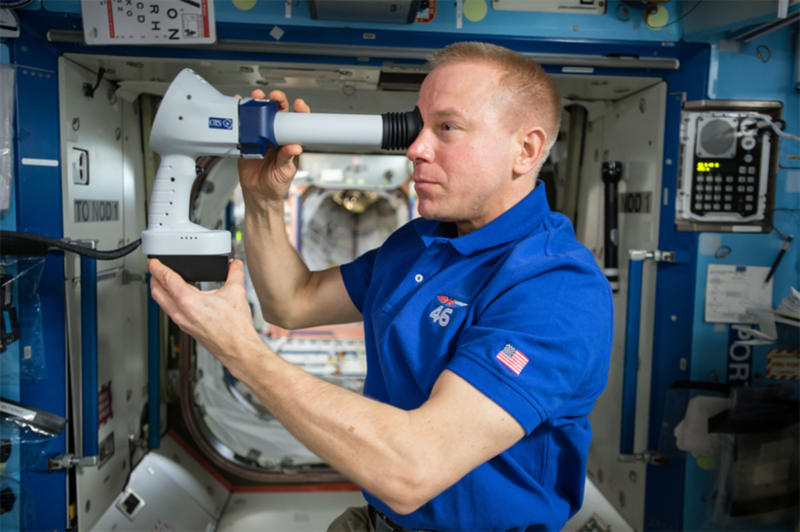 Ultrasound exams have revealed that the backs of their eyeballs had become flattened, and optical coherence tomography has shown optic nerve swelling and structural changes to the retina and choroid while in space. The term coined for these structural and function changes of the eye is visual impairment and intracranial pressure (VIIP). Much research has been done into why these vision problems happen, and many theories exist. One theory postulates that the upward fluid shift that occurs in the body in space is causing pressure to be applied to the optic nerve and the back of the eye, thereby resulting in anatomical changes that affect the person’s eyesight. 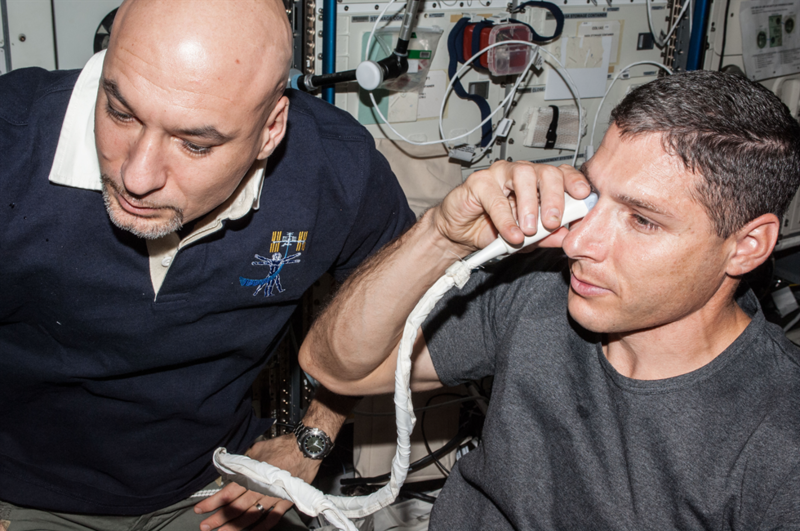 Invasive measurements of intracranial pressure (ICP) have never been measured in a human subject in space, but a noninvasive estimate was recently conducted for the first time aboard the orbiting laboratory. Researchers needed to determine if ICP is elevated to gain a better understanding of the root cause of the vision problems and develop effective countermeasures. So, during the one-year mission in 2015, several noninvasive techniques were used to estimate ICP in crew members. One technique used a device to check fluid pressure in the ear to estimate a change in ICP compared to on Earth. The use of tympanic membrane displacement measurements to assess inner-ear pressure has been the subject of research for more than 15 years. In most people, inner-ear fluids are connected through to intracranial fluids, meaning that a change in ICP is reflected by a corresponding change in inner-ear pressure. Another device operating under a similar audiology-based concept estimated otoacoustic emissions—low-intensity sound waves produced in the inner ear—to estimate ICP. Data from the one-year mission is still being analyzed, but preliminary results suggest that there is not a pathologically large increase in ICP during spaceflight. Dr. Michael Stenger, lead VIIP discipline scientist with KBRwyle, cautions that ICP may still be a contributing factor to VIIP, albeit at a mild, chronically elevated level. Additional noninvasive devices and techniques using ultrasound are being used aboard the space station to further research in this area. Ultrasound is being used to scan the diameter of the optic nerve sheath and to measure the pulsatility index of the middle cerebral artery to monitor ICP. Both of these measures have been correlated with high ICP in patients on Earth, but more research is needed to understand how accurate these noninvasive techniques are in a more normal ICP range. Use of these noninvasive techniques in space could have huge benefits for medicine on Earth.